A line of credit is similar to a credit card, where you have a limit to the amount you can borrow, but only borrow as much as you need at a time. If you have a balance at the end of a period, you will be charged interest on it. You can pay down the amount as much as you want in most cases. Term loans are like mortgages; you get the full amount of the loan, then have regular payments over a set length of time to pay it off. 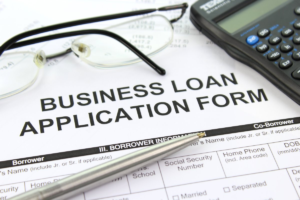 SBA backed loans are simply loans where the government agency provides a guarantee for the lender. This allows them to provide more loans, but usually, the SBA requires more paperwork and the process is slower, taking a few weeks. These are frequently the most affordable loans, use an SBA loan calculator to compare them to other types to see for yourself. A traditional lender is a bank, these are becoming more stringent in their screening for loan applications, so new alternative and online lenders are gaining ground. Some government programs may loan money directly, but most are merely government back loans through other lenders. Each type of lender has different processes for granting loans and things they look for in loaning applications. Lenders want to know that the money they lend will be paid back. They look for the ability of the applicant to repay the loan, the terms, amount, purpose, and interest of the loan. To be sure they can recover their costs if the applicant defaults, they may ask for collateral or insurance for the loan. Lenders will want to see both a business, a personal credit score, and credit report. Your credit score shows your creditworthiness, how likely you are to repay the loan. An individual score will show if you are responsible with your finances, and that indicates if you are likely to do the same with your business. Again, these will be both business and personal taxes. Many small businesses asking for loans are young and small, making it difficult to gauge their long-term success. Your taxes show your ability to manage your finances, and indicating your ability to follow through on your business. A business plan documents your financial goals for your business, as well as your more high-minded goals. Why did you start this business, rather than another? What is the passion that drives you to make money with this business? And how do you plan to create that success? A lender will be interested in learning all of these things from your business plan, so make sure it is accurate and paints a picture of a successful business. A surprisingly obvious piece of information, what plan do you use for the money? Lenders want to know that you will be using it to grow your business, to make it more profitable. They’d also like to know how you plan to do this. As mentioned earlier, collateral is one way of assuring the lender that if the loan defaults, they will be able to recover some of its value. Businesses have much in the way of equipment that could be used as collateral, but many lenders prefer to put a lien against the borrower’s home. Equipment for a business might be difficult to convert to cash, but lenders have long experience with foreclosures on houses and have confidence in their value. It also reveals the determination of the borrower in their business. If they aren’t willing to stake their house on it, they may not be committed enough to succeed. Every item on this list has far more detail than shown here. Be sure to do your research. Your lender will appreciate how prepared you are, yet another way to make them think of you as a good risk! Did you find the information in this article helpful and informative? Leave us a comment with your thoughts in the section below.